The Euro had a completely stagnant day where prices hovered in a very tight range right around our first target. Until I see some decisive confirmation that the current correction is complete, I’m more inclined to view any downward movement as part of that correction. Synopsis: Price will likely reach between 1.1665 and 1.1682. Elliott Wave chart analysis for the EURUSD for 27th July, 2018. Please click on the charts below to enlarge. This main daily count sees that the euro completed maroon wave B and is now moving in a new downtrend in maroon wave C.
Maroon wave C is forming an impulse labeled black waves (1) to (5). Black wave (1) is forming an impulse labeled blue waves 1 to 5. Blue wave 4 formed a running triangle labeled pink waves a through e. It’s very likely complete. This count expects the euro to move toward the downside in blue waves 5. This will be initially confirmed by movement below 1.1575, and it will be further confirmed by movement below 1.1508. At 1.1342 blue wave 5 would reach 100% the length of blue wave 1, then at 1.1095 it would reach 161.8% of its length. This wave count is invalidated by movement above 1.1791 as pink wave e of this triangle may not move beyond the start of pink wave d.
This main hourly count sees that blue wave 5 is forming an impulse labeled pink waves i through v.
Pink wave i formed an impulse labeled green waves (i) through (v). 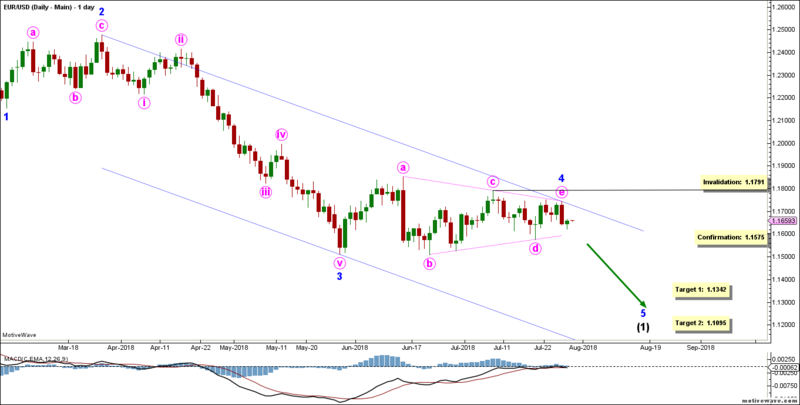 Pink wave ii is now facing resistance around 1.1665. If it breaks above it, it’ll likely continue to 1.1682. 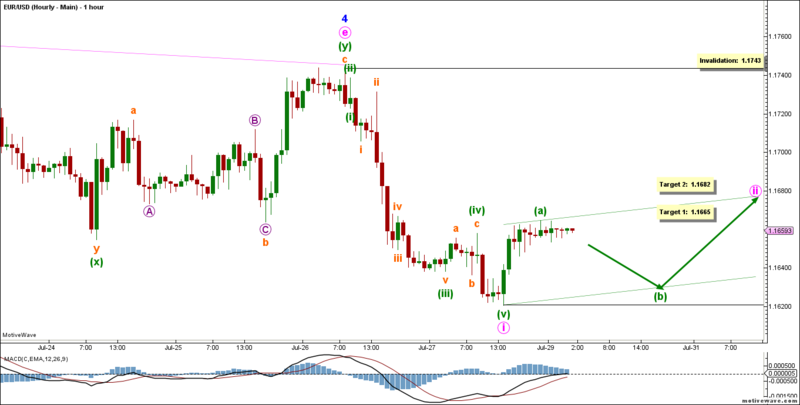 This wave count is invalidated by movement above 1.1743 as pink wave ii may not move beyond the start of pink wave i.